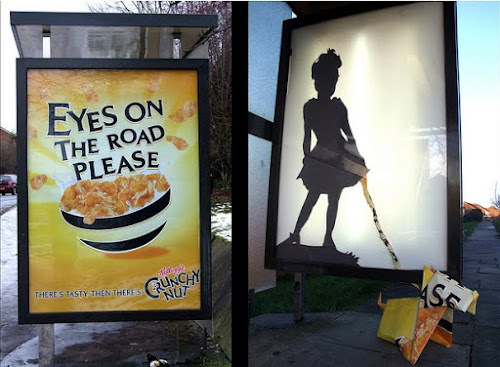 For his latest series of works, UK based artist Eye-saw has been hacking into his local bus shelters and altering the advertising posters on display. For his latest piece pictured above titled 'Underdog Bites Back', we are presented with the before and after shots which sees the removed poster transformed into a Street Origami dog for the piece. A number of the artists other recent interventions can be seen on his flickr site including photos of the the Chainsaw Massacre piece featured in the clip below which follows Eye-saw as he installs the work. Very cool! I hate the ads in the bus shelters here in Montreal.